Updated 4-8-19. Being sued over a notarization is painful for any Notary and costly in time, stress and legal fees. And sometimes Notaries are blamed for document problems even when they aren't at fault. Merchants Bonding Company, the carrier for NNA bonds and insurance policies, recently shared a number of Notary claims with the Notary Bulletin. These claims provide important lessons about protecting yourself from financial liability resulting from the notarizations you perform. In this case, a Notary was asked to visit a hospital and notarize a power of attorney document. The document granted the signer’s friend the right to handle his medical and legal affairs while he was hospitalized. The signer later filed a lawsuit against the Notary, claiming he was not aware of what he was signing. During the case, the plaintiff was declared a “vexatious litigant” by the court after it was learned he had a history of filing frivolous lawsuits. The Notary’s attorney claimed the grounds for the suit were legally insufficient and the court upheld this claim. But, the plaintiff didn’t stop. He filed a second suit against the Notary and several other defendants a year later. Eventually the second case was settled, but not until the Notary incurred additional attorney fees in responding to the new allegations. This case teaches an important lesson. Litigation can get messy, and sometimes litigants don’t give up. As a result, you can incur significant costs in defending yourself — even against frivolous claims. In this instance, the Notary had an errors and omissions insurance policy, and it took a substantial amount of the policy to defend the Notary in both actions. Without a policy with sufficient coverage to absorb all the costs, he would have had to pay the expenses out of his own pocket. Some Notaries assume that they don’t have to carry an E&O policy as long as they don’t make mistakes. As this next case shows, even a blameless Notary can be dragged into a lawsuit. In this situation, the Notary was among several individuals sued for more than $200,000 over a real estate transaction. The litigant claimed the Notary had failed to properly check a signer’s identity during the transaction. Later investigation acquitted the Notary of all wrongdoing. However, the lawsuit proved extremely difficult — and costly — to resolve because of the multiple complaints and cross-complaints involving the numerous defendants. Your financial risk as a Notary often has nothing to do with being right. You can be right and still end up with legal bills. Fortunately, the Notary’s E&O policy in this case paid the legal expenses. In this case, an oversight when recording a journal entry got a Notary into serious legal trouble. During a notarization involving real property, the Notary was distracted and failed to take the signer’s thumbprint for her journal entry as required by state law. It was later discovered that the signer was an impostor, and the Notary was sued for $250,000. After lengthy negotiations, the case was eventually settled, but the Notary’s full E&O policy was exhausted. The lesson here is that E&O insurance will cover claims up to their policy's limit when Notaries are clearly negligent, as in this case where the Notary forgot to obtain the signer’s thumbprint in the journal entry. It happens; people make mistakes. Even good Notaries make mistakes. As bad as it is for a Notary to be sued after following proper procedure, the situation can be even worse if the Notary ignores state rules when verifying a signer’s identity. In this case, the Notary was asked to notarize the signatures of two individuals who signed a deed of trust in buying a property. Since the signers had no ID, the Notary identified them using a single credible identifying witness — the agent representing the signers. State law required the Notary to personally know the witness, but the Notary hardly knew the agent. In addition, the Notary failed to obtain the thumbprints of the signers in her journal. The settlement and legal fees were substantial. By ignoring the rules for Notaries identifying signers and obtaining thumbprints, the defendant in this case not only faced a costly lawsuit but left the transaction vulnerable to potential fraud. In fact, a handwriting expert indicated that it was “highly probable” the signatures notarized on the deed of trust in question were forged. 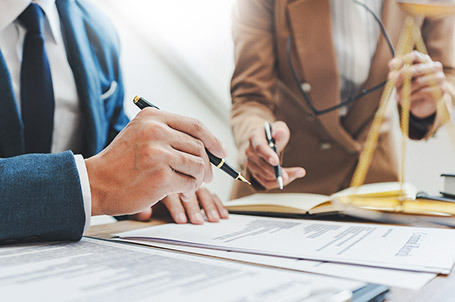 Fortunately for the Notary, the E&O policy covered multiple mistakes in the same claim, which is true of many policies as long as the violations aren’t intentional. You also should be aware that you could be caught up in a legal action even if you are not named in a lawsuit. There have been several situations in which Notaries have received subpoenas for information about a notarization they performed. Subpoenas included requests for Notary journal entries or affidavits or a demand to appear at a deposition to provide information about a past notarization. If you are served with a subpoena, an E&O policy that covers attorney costs helps make sure you'll have a lawyer's legal guidance when responding to the subpoena. It also helps you avoid being named in the lawsuit, and aids in covering legal fees. Following your state’s laws and best practices will take you far in protecting your Notary practice from legal action. But it won’t take you all the way. For the last mile, you’ll need an errors and omissions insurance policy. While Notary bond and insurance claims are infrequent, no Notary is immune to liability. You can make a mistake that financially harms a signer. You can do everything right and still end up in court. You can face litigious plaintiffs who will try more than once to find you at fault and make you pay. The good news is that, for all of these reasons, there’s Notary E&O insurance. Hello. All our Bulletin articles are open to viewing by the public at no charge. If you are having trouble viewing an article, please contact us at social@nationalnotary.org with a description of the problem and we'll try to assist you. What states require the journal? If not required but I use one do u have to get thumb print? Hello. If you are in a state where a Notary journal is not required by law, you may ask the signer for a thumbprint, but it is the signer's choice to provide one or not. The signer has the option to say no. If you can let us know what state you are in, we can provide you with information about your state's journal requirements. It's not required in Indiana, but is recommended by state officials. Hello. You can post your question here or contact our Hotline team at hotline@nationalnotary.org. Is a journal or thumb print required in Maryland? In the first two examples of lawsuits against a notary, the notary made no errors or omissions, so how is it that E&O insurance covered their legal expenses? I would have thought the expenses would have been covered by their bonding agency. Please clarify. Hello. Any questions regarding liability for a fradulent document would have to be decided in a court of law. If you have legal questions about a fraudulent document, you will need to contact a qualified attorney. Hi Brenda. Any questions regarding grounds for a lawsuit against a Notary would need to be answered by a qualified attorney.